A copper alloy Late Bronze Age tongue-shaped scabbard chape dating to the period c. 1050 - 800 BC. The chape has tapering sides and is lozengiform in cross-section with a pronounced median rib characteristic of this type of chape. The tip of the chape is rounded and features a circular projection which may be stylistic attempt to copy similar forms which feature washers and bosses on the base. The tip of the chape is solid. It becomes hollow at the point where one side of the chape has broken off due to old damage. Cf. ESS-9A1663 for a similar example on the database. 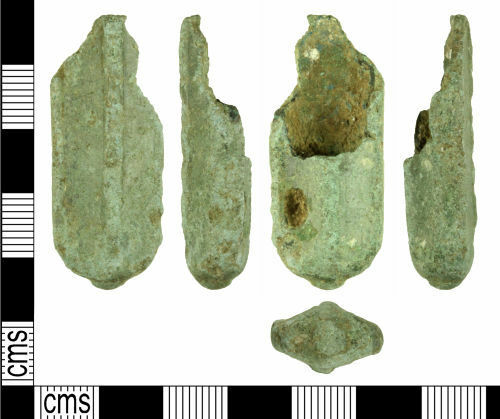 Similar examples have been found in the Salisbury Hoard and the Guilsfield hoard. Thanks are extended to Adam Gwilt and Dot Boughton for their assistance in identifying this object.